The Federal Reserve hiked interest rates by a quarter percent as expected on Wednesday. That lifted the benchmark Federal funds rate to 1.50-1.75%. That move was widely telegraphed by Fed officials for months and markets were well prepared for the news. What surprised investors was an additional rate hike penciled in for next year. Three not four rate hikes in 2018 - The Fed's famous "dot-plot" chart, which shows the Fed policy maker's anonymous rate forecasts, indicates the Fed is on track to hike rates twice more in 2018. Some on Wall Street had expected the Fed to hike more this year that encouraged gold investors in the wake of the Fed's announcement. Stock investors were jolted by the Fed's signals of a faster pace of interest rate hikes in 2019. Now, the central bank expects to raise rates three times next year, rather than two just previously forecast. How did markets react to the news? Spot gold hung onto solid gains scored earlier in the day Wednesday, trading around $1,327 an ounce. That's up from Tuesday's London pm gold fix at $1,311 an ounce. The Dow erased gains and turned lower during Fed Chair Powell's press conference. Apple stock shares fell sharply. The yield on the 10-year Treasury note jumped to 2.91% on Wednesday, up from 2.88% on Tuesday. 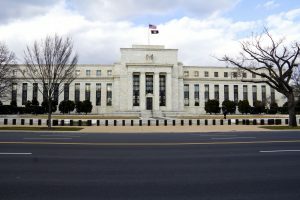 This is the sixth interest rate hike in the current monetary tightening cycle, as the central bank attempts to lift the economy toward a more normal interest rate environment. Despite all the drama and intrigue over rate hikes, the new 1.50-1.75% remains abnormally and historically low – well below more the 3.5-4.0% range seen during typical economic expansions. The U.S. economy is growing, aided by a big dose of fiscal stimulus from the recent tax cuts. But, for how long? Some investment firms, like Capital Economics, expect economic growth to slow in 2019, which will mean the Fed will have to start cutting interest rates as early as 2020. While interest rates nudge higher and lower, it has little impact on the long-term value of investing in physical gold, silver and numismatics. The long-term trend for gold remains up. Gold represents a hard asset, an alternative monetary outlet that is not degraded by any government or deficit. Gold offers investors a proven portfolio diversification tool, against the inevitable decline in the stock market. Gold prices are climbing and will likely be more expensive next month. Current levels offer investors perhaps the best buying opportunity of 2018. Contact your Blanchard portfolio manager today for an update on how you can maximize today's opportunity to grow your long-term wealth.